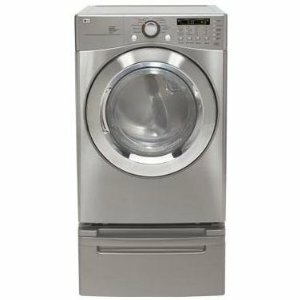 The LG DLG2702V gas dryer features a NeverRust Stainless Steel drum and huge capacity at 7.4 cu. ft. Its huge capacity allows you to dry all your clothes, sheets, and towels in just a few cycles. The Sensor Dry system makes sure that the right temperatures and drying times are utilized, by calculating the moisture level in the drum, so that your clothes and sheets come out completely dry yet wrinkle-free. The Sensor Dry System calculates the level of moisture in the drum so that the right drying times and temperatures are used and maintained throughout the cycles. This smart dryer, with its moisture sensors, maintains the right drying temperatures to deliver only optimal results. The LoDecibel Quiet System ensures that each drying operation is quiet and free from unnecessary vibration so you can carry out your drying tasks peacefully. The different drying programs allow you to choose the right drying settings accordingly so that drying everything, from your bed sheets to your delicates, are done thoroughly. The End of Cycle Beeper is a convenience feature that alerts you once the cycle is over so you can proceed with the rest of your drying tasks. The Child Lock Option automatically secures the dryer while the cycle is going on, so that no unwarranted changes in the settings may be made. The FlowSense Duct Clogging Indicator alerts you when the dryer duct necessitates cleaning and maintenance so that airflow is always maximized. The reversible and wide opening door of this dryer makes loading and unloading the garments quick and easy. This dryer is available only in one exterior styling or color, which is Graphite Steel. Easily choose the right settings with its Electronic Control Panel with Dial-A-Cycle feature. Maintain the needed stability on any type of surface with the 4 adjustable leveling legs of this dryer. Enjoy freshly dried, wrinkle-free clothes out of the dryer as the SensorDry System of this dryer smartly calculates moisture levels in the drum. Be alerted when the duct already needs cleaning, as the FlowSense Duct Clogging Indicator signals whenever there is too much lint build up in the duct and cleaning is immediately needed. This dryer comes with various exterior finishes, from its chrome door rim with silver edging to its porcelain top plate, painted steel cabinet, and NeveRust Stainless steel drum. Determine how much time is left for each cycle through the Remaining Time Display feature or Status Indicator. Although gas dryers are presumed to be more energy efficient than their electric counterparts, this gas dryer has not earned an Energy Star rating. Unlike other LG dryer models available in the market, this particular model does not come with the Steam Cycle feature. This gas dryer is available only in one exterior styling or color, which is Graphite Steel.